This was a lot of fun. Riko is a street thug, the muscle in a gang of criminals clinging to existence in a near-future cyberpunk dystopia. She wakes up in an unfamiliar lab and has to fight her way out. Riko thinks it’s just the result of a bender but soon discovers her world is far more messed up than that. In order to find out what happened to her Riko is forced to reassess all her relationships and everything she thinks she knows about her world and herself. Necrotech is fast-paced and relentless and carried me quickly into the world. It’s possibly the most entertaining book I’ve read this year. The world-building is full of lots of lovely, rich details. I particularly liked the idea that everyone has a chipset implanted in their brain for communications which constantly exposed them to advertising, unless you can pay to remove ads. Riko is an interesting narrator. She has a bolshy attitude and a strong tendency to punch first and ask questions later – even when she knows full well that this is against her best interests. Towards the end of the book Riko begins to develop some flickers of self-awareness. She has doubts all the way through due to the memory loss – because she doesn’t know what happened she has to question her actions. Some of the evidence she uncovers indicates that she might be involved in activities Riko finds repugnant, and yet she can’t be confident that it’s not true. I hope this is the first in a series because the book ends on the cusp of some serious character development. If there’s one thing that I found a little disappointing it’s that Riko is a strong female character in a man’s world. In almost all respects, Necrotech has a diverse cast of characters with a range of skin colour, sexuality, and physical abilities presented in a way that adds to the worldbuilding. It’s really very good. Except for the lack of supporting female characters. I would have liked more. But it’s a minor point. 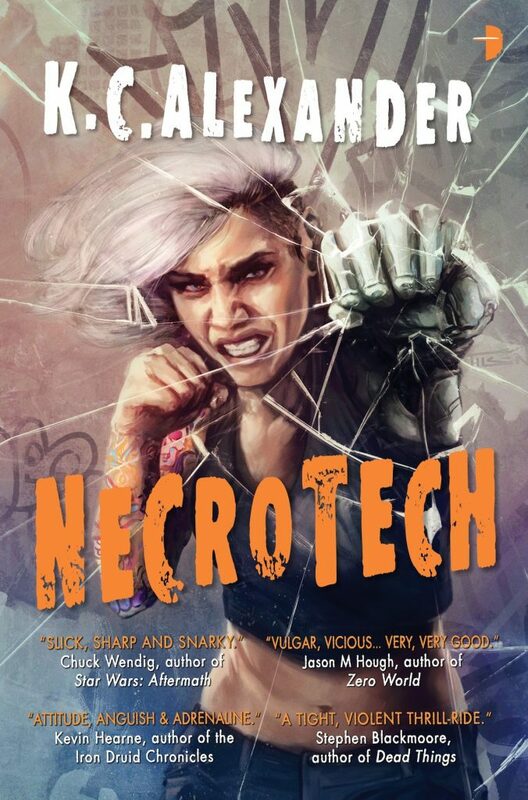 Necrotech is gripping, funny, shocking, and absorbing. I read the first few pages and couldn’t put it down. The pace keeps up all the way through the book and the surprises keep coming as Riko uncovers more. I loved it and I’m looking forward to a sequel.